Nice way to end the week – Pamela Wood. It’s not always fun to be in newspaper journalism these days, what with all the doom-and-gloom about our industry going down the crapper. We’ve had painful staff cuts, frozen salaries and forced furlough days. We’ve lost many talented people, especially photographers and editors, who make reporters look good. So today was a nice day, as the local newspaper industry celebrated the things that we’re still managing to do right. The Maryland-Delaware-DC Press Association held its annual awards ceremony for news, advertising and online efforts from 2009. The Capital and the Maryland Gazette picked up several awards, including for general website excellence, and our sister paper, The Carroll County Times, was named the best newspaper overall for its size. I won two awards in our circulation division (mid-size daily newspapers). I picked up first place for environment for a story about how the Blue Plains sewage plant in D.C. is the single largest pollution source to the Chesapeake Bay. And I won first place for feature profile for a story I wrote about Pat Mahoney Sr. and Pat Mahoney Jr., the last watermen of Eastport. I don’t do what I do to win awards — they really are quite a crapshoot. I do what I do for my readers. I try and tell good stories. And the Mahoneys, well, they had a great story. The Mahoneys are the last working watermen in Eastport, which itself is the last part of Annapolis with any semblance of a working waterfront. The rest of the waterfront switched over to tourism and pleasure boating long ago. I met the Mahoneys at a little local organic food market that used to be held once a week in an industrial part of town. They were selling rockfish and I was there buying beef and greens. I got to know them a bit and convinced them to let me write about them. I’ve talked with them several times since. Sometimes I’ve interviewed them for other articles about the bay and other times I’ve stopped in to buy a crabcake. So, Pat Mahoney Sr. and Jr., this one’s for you! 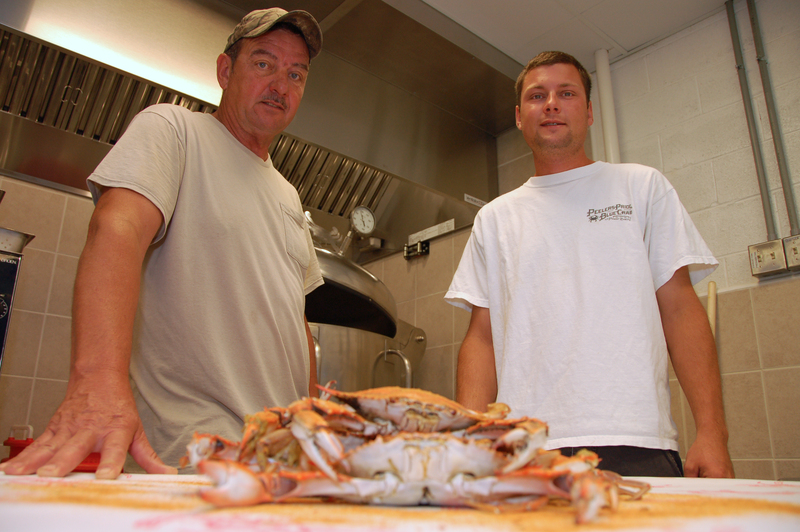 Pat Mahoney Sr. and Pat Mahoney Jr., working watermen and owners of Wild Country Seafood. NOTE: I’ll post the full story when I am back in the newsroom with archives access. The online version of the story is expired, but you can still see the video and the photo slideshow I made of the Mahoneys.